Bernie Sanders owns the future of the Democratic Party. In 2008, voters under 30 propelled Barack Obama to victory, choosing the Illinois senator over Hillary Clinton by a 43-point margin. 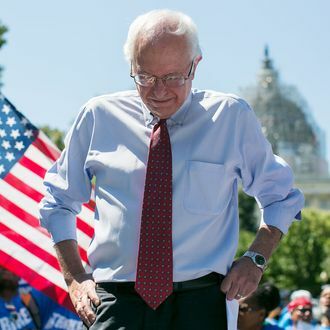 In 2016, those younger voters single-handedly lifted America’s favorite democratic socialist to a virtual tie: Sanders outperformed Clinton among voters 18 to 29 by 70 points, according to CNN’s entrance poll. Sanders is already a historic candidate—the first socialist in a century to build a genuine mass movement in American party politics. And whatever the Democratic Party is in the next 20 or 30 years, it will owe a great deal to Sanders and all the people—young or otherwise—who felt the Bern. Sanders decisively won with Iowa’s future Monday night. As far as the present is concerned, it’s difficult to say. It appears Clinton will edge Sanders by some nominal fraction of delegates. Considering the structural disadvantages Sanders faced — the concentration of his support among college students in a few select counties — it’s entirely possible the Vermont senator actually turned out more supporters than Clinton did. But with Clinton’s prohibitive lead among superdelegates, to actually be on pace for the nomination, Sanders would have needed to win big Monday night. And the demographics of Iowa are much more favorable for Sanders than most upcoming states. To this point, Sanders has struggled to expand his base of support among nonwhite voters. So his failure to mount a decisive victory could reasonably be considered a win for Clinton, who still boasts a substantial lead in national polls. Sanders will almost certainly win in New Hampshire next week. After that, the socialist’s prospects appear dicey. But in the long term, socialism’s chances of becoming a force in American politics are looking a lot better than they did when this political revolution was launched.